The Association organises nature outings for its members with a guide on the Tour du Valat Estate (Tour du Valat Nature Reserve, Verdier marshes, and the Petit Saint Jean Estate). Upcoming outings are listed on our events page. Saturday 2nd June, 2018, with Sylviane Johnson. Discover Verdier marshes. Saturday 18 November, 2017, with Marion Lourenço, a Ranger at the Tour du Valat Regional Nature Reserve. Presentation of the Tour du Valat Regional Nature Reserve all the way to the Saint Seren hide. 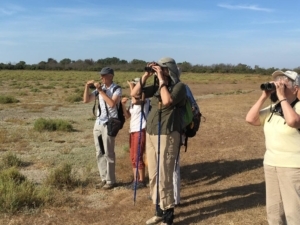 Saturday 3 September, 2016, on the Tour du Valat Estate with Patrick Grillas, Director of the Science Programme, to discover this magnificent nature reserve in the heart of the Camargue.